Newly built 700 square foot self-contained living space in a private, separate wing of the house. The bedroom and living areas are filled with light, looking out to gorgeous views of the three mountains - Mauna Kea, Mauna Loa and Hualalai. Enjoy the fully equipped kitchen, dining area, cozy reading nook in the living room, spacious bedroom with walk-in closet, brand new bathroom with walk-in shower, wireless internet and Direct TV (movies, tv shows and music channels). The teak bench in front of the cottage is a perfect place to sit and watch the clouds play over Mauna Kea. Out the back door off the kitchen, there is a new gas barbecue and table and chairs for dining or enjoying sunsets or the bright starry nights. There is also a storage chest full of beach chairs, boogie boards and snorkel gear for your use. Our 3-acre property has a large house we recently remodeled to include the guest cottage at one end of the house. My husband and I live in a separate wing on the other end of our L-shaped home. The two living spaces are separated by a covered lanai with fencing and landscaping providing privacy for each dwelling. We respect our guestsʻ privacy and enjoy our own. We are also happy to answer questions you may have to help you enjoy your stay on the island. We will be happy to steer you to our favorite restaurants, beaches, walking trails and island adventures. We enjoy gardening and have planted fruit trees, some vegetables and herbs and many flowers. You are welcome to share fruits and vegetables that are ripe during your stay - we often have bananas, lilikoʻi, or papaya and fresh herbs. Situated on the 'dry side' of Waimea, we are half way between Kawaihae and Waimea town, ten minutes drive from both. The best beaches on the island are 10-15 minutes away. Located at 1800 foot elevation, our days are sunny and warm. Temperatures cool down in the evening - perfect for a good nights sleep. Cardinals, doves, finches and other birds fill our quiet 3-acre property with song. After living in the Sierra Nevada for 30 years, we came to Hawaiʻi in 2007. We love the quick and easy access to both town and beach. This is our favorite climate zone with warm sunny days and cooler nights. It took us five years to find just the right place - 3 acres on a quiet street with expansive views out to three mountains, and space and sun to grow mangos, papayas, bananas, avocados and lilikoʻi. We love the community of Waimea and the great snorkeling beaches just down the road. Large walk-in shower. Plenty of amenities including hair dryer, shampoo, conditioner and lotion. 10-15 minute drive to great Kohala Coast beaches including Hapuna Beach, Waialea Bay (Beach 69), Puako, Spencer Beach, Mauna Kea and other resort beaches, and more. On 3 acres in the country, yet 10 minutes to beaches and town. Expansive views of Mauna Kea, Mauna Loa and Hualalai. A yoga mat is available for your use. The living room is full of light and has a gorgeous view out to the 3 mountains. 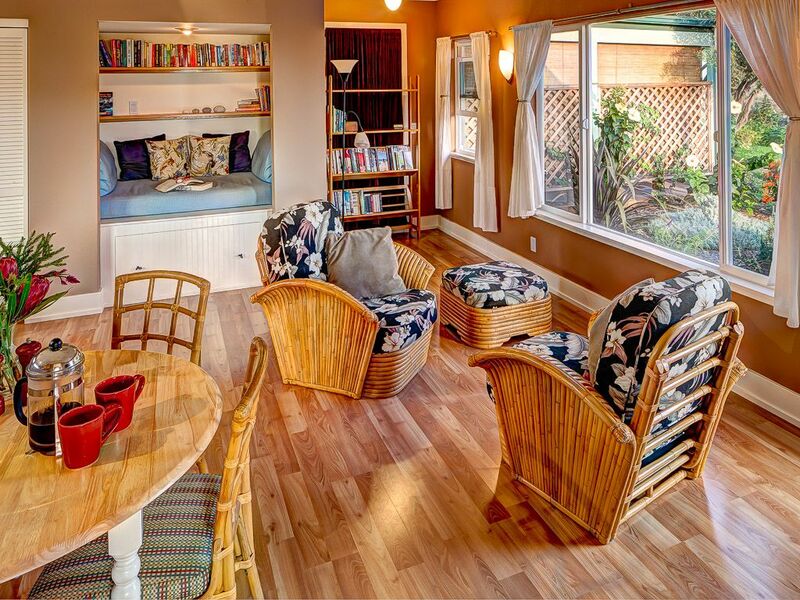 Enjoy the comfortable island style furniture and cozy reading nook. Outdoor barbecue with gas grill and additional gas burner. Extra large convection toaster oven. Big enough for baking. There are 3 options in your kitchen - an electric coffee maker, a French Press, and a Melita filter drip system. Basic sundries provided including spices, olive oil, sugar, assorted teas and enough coffee to get you started. The kitchen is well stocked with dishes and utensils. Well equipped with plenty of storage. Small appliances include a waffle maker, blender and rice cooker. There is a dining table in the living room. There is also another dining table with 2 chairs in the back yard near the barbecue. Direct TV with movies, tv shows and music stations. Island guide books, snorkel and hiking trail guides are provided along with a reading nook full of books including local lore, non-fiction, westerns, mysteries, science fiction and childrenʻs books. Nice selection of DVDs provided. Additional DVDs can be rented for about a dollar from Redbox and Jetflix booths in town less than 10 minutes away. There is a private area behind the cottage for barbecuing, eating and enjoying sunny days or brilliant starry nights. A teak bench in front of the cottage with expansive mountain views. Kayaks are available for rent near by. Boogie boards, snorkel equipment and beach chairs are provided. Several excellent golf courses are nearby. There are excellent caterers, massage therapists, acupuncturists and estheticians available. Please feel free to ask for referrals. Catrinka has the art of aloha down. It takes a special touch to be extremely organized and clean and tidy but still make people feel very much at home and comfortable and let them feel it is their home, too. The apartment is the other half of their house but is arranged with privacy in mind. We really enjoyed this lovely space with relaxing rich colors and furnishings and with all the helpful touches. We came in at sunset hungry and tired and found the list of good restaurants listed by pricing....smart! We will be back. So much attention to detail and comfort. Beautifully located between Kohala coast resorts and Waimea good eating. It was a pleasure meeting you. I'm happy you enjoyed your stay here. Warm Aloha to you. Such a great stay! Catrinka is such a wonderful host and the house was everything we expected. A great central location for the west end of the island and all the amazing sites. House was clean, comfortable and private. I'm happy you enjoyed your time here. It was a pleasure meeting you. Mahalo for leaving everything in such good condition. Come back when you can! The peace and quiet here is devine. The sunrises over the mountains were spectacular. The house was stocked with everything we needed for our stay. Our host Catrinka, was friendly and helpful with the any questions we had and very much respected our privacy. So good to meet you both. Thank you for leaving everything in such beautiful condition. Hope to see you here again at Mauna Kea Moonrise some day. Aloha. The suite is everything that it is described to be. Spotlessly clean, tastefully decorated, comfortable bed, bright and airy. Beautiful panoramic views of both the sunrise and the sunset in January. Many thoughtful touches, including good knives in the kitchen, games, books, and ample supplies of things to take to the beach . We loved it and Katrinka was a great host. If you're lucky, you too will get to taste some of her delicious homemade cookies! Mahalo for your kind words. We are so glad you enjoyed your stay here. We sure got to enjoy some gorgeous sunsets! Much Aloha to you both. We very much enjoyed our stay at this clean and well appointed apartment, which was equipped with cooking accessories, guide books, and beach supplies. It is 10 minutes to the best beaches and a short drive to grocery stores, coffee shops, restaurants, and farmers' markets. I would return again! You will be most welcome to return. It was a pleasure having you here! Wishing you all the best! The Kohala Coast has some of the best beaches in Hawaii 10-15 minutes away. Excellent for snorkeling and scuba and enjoying the sand and surf. The town of Waimea, just 10 minutes away, has excellent restaurants (many utilizing farm to table fresh ingredients), the Kahilu Theatre with world class entertainment, grocery stores, drugstore, hospital, local cultural events, several weekly farmers markets, parks, and shopping. The little town of Kawaihae is 10 minutes drive in the other direction and also has some great restaurants, a great place to buy fresh fish, the Puʻukohola Heiau national park and picnic tables by the bay. Check in time is 3pm. Check out time is 10am. Cancellation Policy: Up until 60 days before arrival date, we refund full amount of your payments minus $50 cancellation fee and minus any credit card or other fees that have already been paid that we cannot get reimbursed. For cancellations after 60 days before arrival date: If property is re-booked, we refund any balance of income not lost due to original booking minus $50 cancellation fee and minus any credit card or other fees that have already been paid that we cannot get reimbursed. We comply with State of Hawaii Accommodations Regulations. Our Hawaii State Transient Accommodations Tax (TAT) I.D. # is W40906219-01.